In collaboration with Waiting 4 the Bus and Librotraficante, during Banned Books Week. Click here to find out more about the program. “50 for Freedom of Speech.” Click here to read more about the program. Dissecting Adam: An Improvised Opera is part of the EdgeUP Festival, curated by Tricia Van Eck.Edgewater / Uptown are featured neighborhoods during the 2013 Chicago Artists Month. On September 28, many poets around the world made their voices heard. To declare the change they'd like to see most in the U.S. and throughout the international community, events were staged worldwide as part of 100 Thousand Poets for Change. 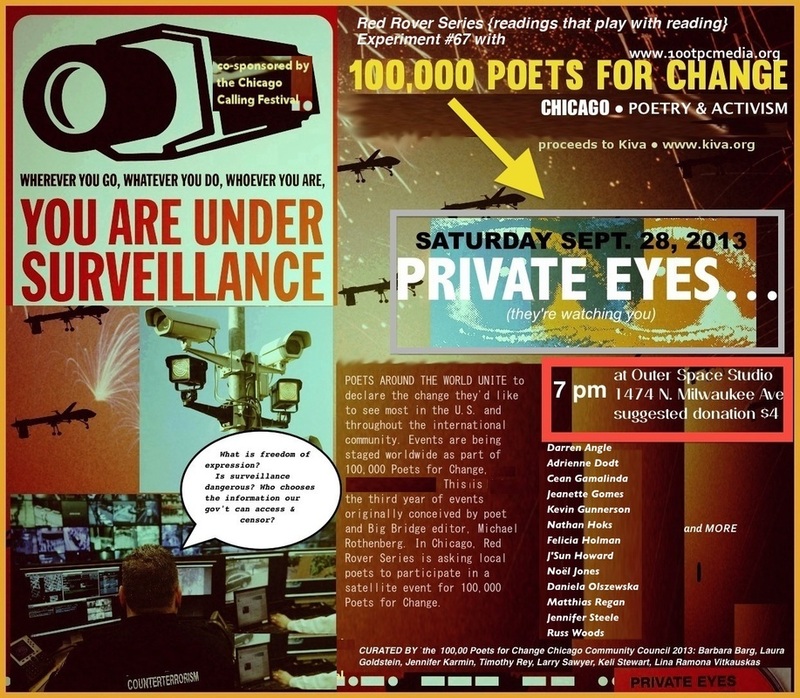 This night of poetry and activism in Chicago asked the questions: What is freedom of expression? Is surveillance dangerous? Who chooses the information our government can access and censor? Click here to find out about the participants, curators, and more. “Harvest Fest: An Interfaith Arts Celebration” features music, poetry, and readings from sacred texts—focused on the themes of harvest, thanksgiving, and autumn. This 2013 Chicago Calling Arts Festival event is co-sponsored by the Peoples Church, Treasures of Uptown, and the Borderbend Arts Collective. Click here to read the program. "Water Music on the Beach" is part of the EdgeUP Festival, curated by Tricia Van Eck. Edgewater / Uptown are featured neighborhoods during the 2013 Chicago Artists Month. "NSA: A Surveillance Throwdown" involves artists and community activists responding to surveillance. Time for a party throwdown, Orwellian style—with poetry and fiction readings, musical performances, and more. The program includes performances by the Next Objectivists, Great Lakes Ensemble, Tarnation Boys, Kevin Kilroy, and others. Click here to find out more. Artists, environmentalists, urban gardeners, activists & others in the community gather at the Grant Theater to celebrate and explore connections between nature, the arts, and urbanism. "Ars in Natura, Urbs in Horto" includes a panel discussion, performance by the Great Lakes Ensemble, and more. Click here to find out more. The Eighth Annual Chicago Calling Arts Festival was part of the Chicago Artists Month 2013, the 18th annual celebration of Chicago’s vibrant art community presented by the Chicago Department of Cultural Affairs and Special Events. For more information, visit www.chicagoartistsmonth.org.